Proceedings for WESTAF's 17th Cultural Policy Symposium, "The Future History of Public Art," are now available. This gathering of public art practitioners and allied professionals convened November 5-7 in Honolulu, Hawai'i and was organized by WESTAF in collaboration with Forecast Public Art and the Hawai'i State Foundation on Culture and the Arts. For the first time ever, the public art field will have access to a collection management system built specifically for public art collections. The system will accommodate the public art process workflow from commissioning through conservation and is designed to reduce staff time while increasing the flow of information to administrators, artists, and the public. A special benefit of the system is that it can be associated with the existing Public Art Archive site, which contains images and text data on more than 12,000 works of public art and over 33,000 images. Later this month, the Archive will move to a new platform that will be more robust and have the ability to link to an array of engagement and social media tools currently being developed for the site. In addition to its ability to manage a public art collection and associated processes, the Public Art Archive's CMS will allow users to efficiently push data directly into the Public Art Archive. 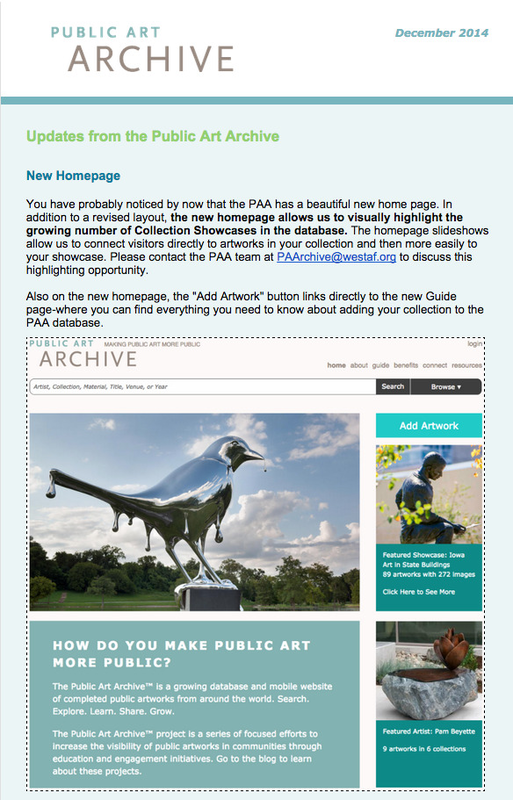 There are many substantial benefits of connecting to PAA's existing network of searchable works of public art. 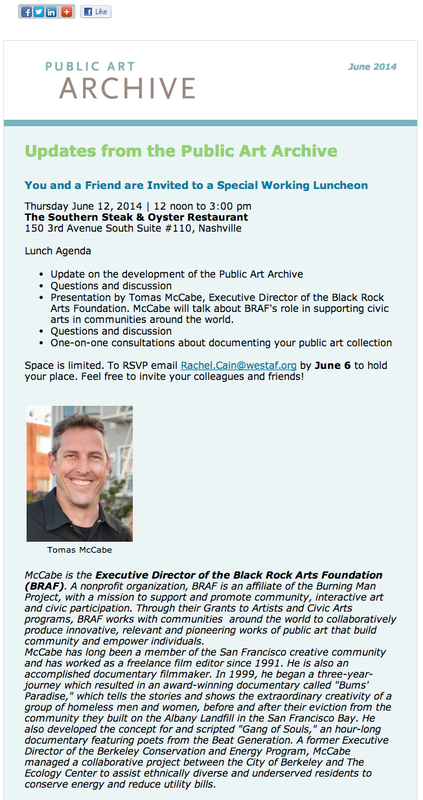 These include increased exposure of public art collections beyond local networks, the ability to easily edit existing records and attach additional information and multimedia content to works of art in the database, and the use of social media tools and API integrations that are designed to prolong and deepen engagement with public art. Learn More. Click here to watch a 15 minute introductory video to the new system. Sign up to get interesting news and updates delivered to your inbox. The PAArtners Periodical is sent seasonally. 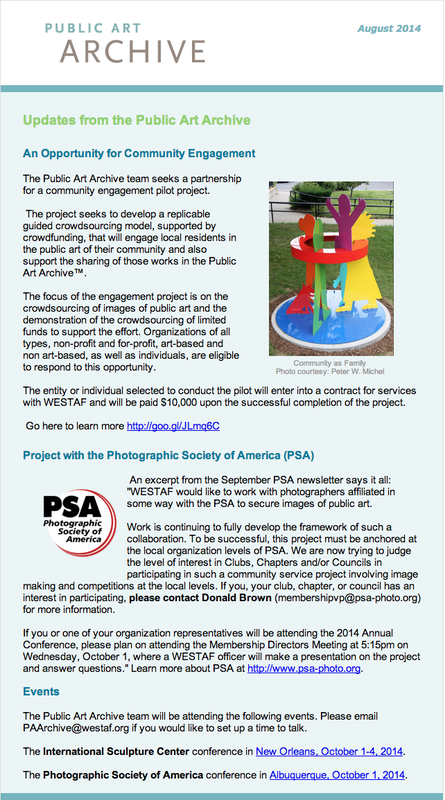 The newsletter covers topics ranging from Public Art Archive™ initiatives, the growth of the database and upgraded features to public art professional development opportunities and a few tips and tricks for collection management. Navigate to Locate Public Art. Discover art near you - anytime, anywhere. Create a map of public artworks to explore. Get directions directly from the Locate tool!